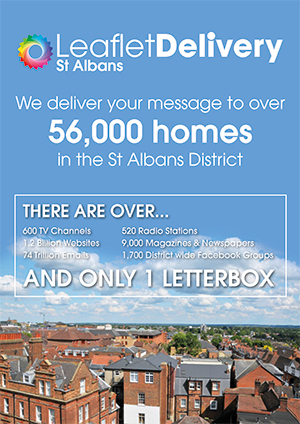 At Print Shop St Albans we have been distributing leaflets to over 55,000 homes in the St Albans District. We offer a tailor made door to door leaflet delivery service for you to promote your business or event. We deliver anything from business card size up to magazines and brochures. The average sized leaflet though is A5 and A6. We have been delivering leaflets since 2009 through our sister company ‘Leaflet Delivery St Albans’ but we also deliver to Harpenden, Redbourn & St Albans. The reason we have been around for so long is that we have invested a huge amount of time and due to having lived in Harpenden and St Albans for over 40 years know the areas like the backs of our hands which gives us a huge advantage over our competition. How do I know my leaflet will be delivered? Our delivery team are all adults as we don’t employ anyone under the age of 18 and for most of the team are in full-time employment with us. They are GPS tracked. This isn’t because we don’t trust them it’s so we can give the customer a detailed report at the end of the round so they can see that the leaflets have been delivered to exactly where they’ve asked them to go. The customer can also have live tracking so they can see where the delivery guy is. This means they can pop out and ask to see the contents of the delivery bag to make sure that the correct leaflet is being delivered. It’s also a great tool as the reports created will list any roads that may be missed due to human error so we can send the delivery guys back to complete the whole area. It also tracks how long the job took and produces a snail trail and if you zoom in close enough you can actually see they have walked down the driveway. It costs us a lot of money to have the system in place but we think it’s worth it and we don’t charge the customer any extra. In this day and age are all literally hammered all day long with Social Media and Spam emails which get deleted straight away or you just scroll past the adverts in Facebook and Twitter. With a leaflet on the doormat the householder has to bend down and pick up your leaflet so you’ve already got their attention and so long as your leaflet stands out from the crowd then you may well be on to a winner and they will read it and hopefully act on it. It’s then over to you when contacted by them to turn that phone call in to a sale. The average uptake on leaflets is 1-3%… 3% for example being a takeaway as that is something most of us order with the 1% being something that maybe for a health club for ladies as it’s already cut out half the audience as men aren’t allowed to join. But… leaflet delivery doesn’t obviously work out every time as you would have hundreds through your door each day. It’s been proved that people need to see things up to 3 times for your brand to stay in their memory and trust you. That is why you see the same TV adverts all the time and you find yourself humming the tunes they play in them. It’s for brand awareness and then once you are trusted then the householder/customer will call or email you. Although… the obvious hopeful outcome you will strike gold on your first door drop. The best and and most cost effective way is for example to print 30,000 leaflets and deliver to the same 10,000 homes every month for 3 months rather than doing a blanket drop. Just follow the 3 time rule as you’ll have more chance of picking up new customers. Or you could print 15,000 leaflets and deliver to the same 5,000 homes – it really depends on your budget. Your leaflet delivered with a maximum of 2 others. Any more than 3 we feel it dilutes your message as the more leaflets on the door mat the more chance they will get to the bin quicker. This is seen as the most cost effective method of leaflet delivery due to sharing the cost with the 2 other leaflets. Your leaflets are delivered on their own, to area’s which you want them to go to. We can of course recommend which areas would suit your type of business. We have maps of all the areas split up in to areas. St Albans for instance has 21 areas so you could choose the city centre which has 2,500 homes, Sandridge 1,000 homes Chiswell Green 1,700 and so on. We can sit with you and suggest the best areas to go to due to knowing the demographics of the areas. The best way of knowing that your delivery is going out is the sheer number of repeat clients we have on our books and they’ve been with us for a number of years and repeatedly have up to 20,000 leaflets delivered every month through our trustworthy delivery team.